If you know us (or even just passed us on the street haha), you know we're crazy about dogs. You can imagine the excitement we had this month when we photographed not one, not two, but three engagement sessions in a row that featured our couples' furry best friends! 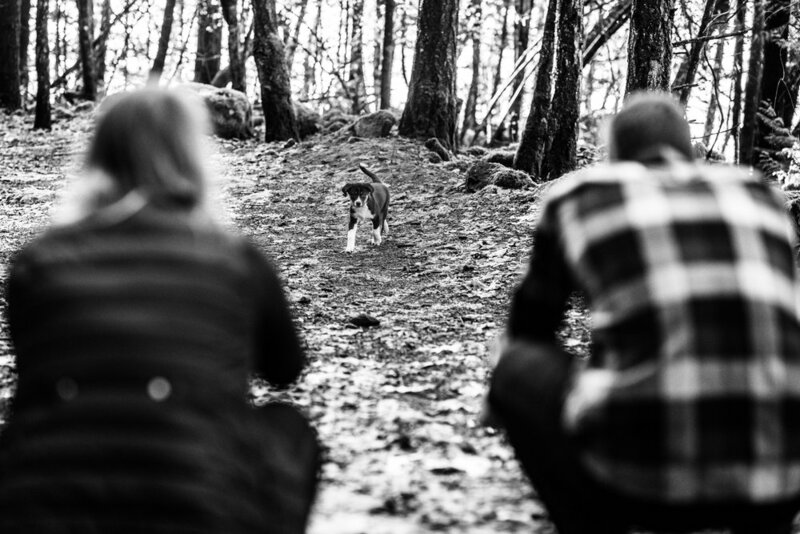 Our most recent were Amanda and Alex, and the new addition to their family, Kenzie, who was named after one of Amanda and Alex's favourite Victoria trails, and the location of our engagement session with them: McKenzie Bight Trail. With the rain storms that have been pouring down on the west coast lately, we ended up hitting the sunny-autumn-day-jackpot on our photos with Amanda and Alex. It was fun to get to know Alex and Amanda as we explored around the trail that these two have grown so fond of, and to watch as sunlight filtered through the leaves, as their puppy dashed around up and down the trails, and as heaps of seals floated around the base of a river waiting for fish as the sun dipped behind the hills. Amanda and Alex have such a great connection, and have so much fun together that we just can't wait for their Metchosin wedding at Pearson College next year. Thanks so much for spending a fun afternoon with us, Amanda and Alex! We hope you love your photos as much as us! More of our Recent Couples! !